Did you ever play Animal Lotto as a kid, the Memory game of matching picture pairs? That’s where I first learned about the Ostrich, the Platypus, and many other unique curiosities of the animal world. 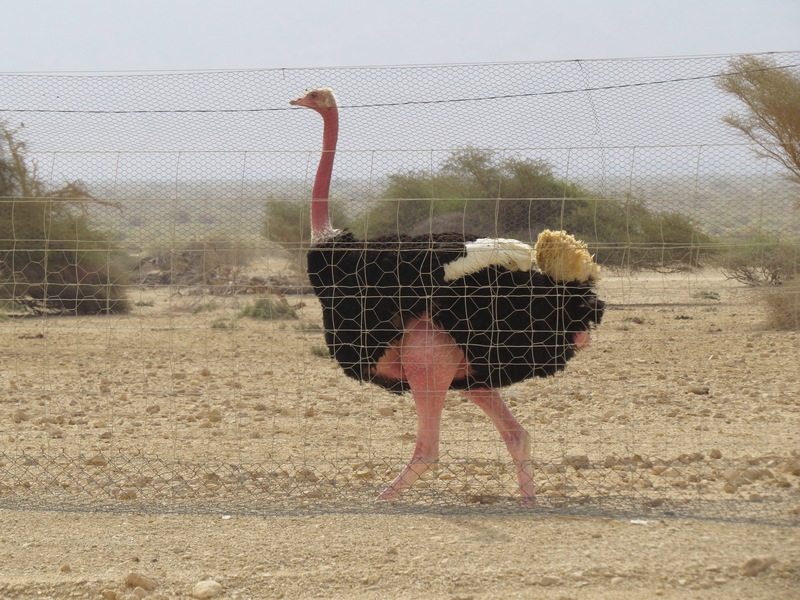 Many years later, I saw Ostriches for the first time in the wild at the Hai Bar, a large preserve established in the 1970’s in the Arava Desert in southern Israel. The preserve is adjacent to Kibbutz Yotvata, about 30 minutes north of the Red Sea. Watching a real live Ostrich in its natural surroundings is astonishing! My husband and I were lucky enough to spot these gigantic birds at the Hai Bar from the roadside as we were driving north from Eilat last week. We noticed that when they encountered one another, this pair in the video clip above began running back and forth, as if playing a chasing game. Or . . . maybe it’s mating season! An Ostrich can be up to 9 feet tall, weigh 150-300 or more pounds, and run at a sustained speed of 30+ mph, but cannot fly. Interestingly, their eyes (about 2″ across) are the largest of any land animal – considerably larger than their brains!! The Ostrich is also mentioned in the Book of Job, and in the Talmud. Once prevalent in Israel and throughout the Middle East, the Ostrich was hunted nearly to extinction in recent times (Jewish Virtual Library), and no longer existed in Israel after the 1930’s. In the early 1970’s, the Hai Bar began “a reintroduction programme …raising birds in captivity for release into the wild” (A Photographic Guide to the Birds of Israel and the Middle East, by Cottridge & Porter, 2007, p. 14). Ostriches are still quite widespread in many parts of Africa. See African Wildlife Foundation and Bird Life International for more interesting information about this fascinating creature. 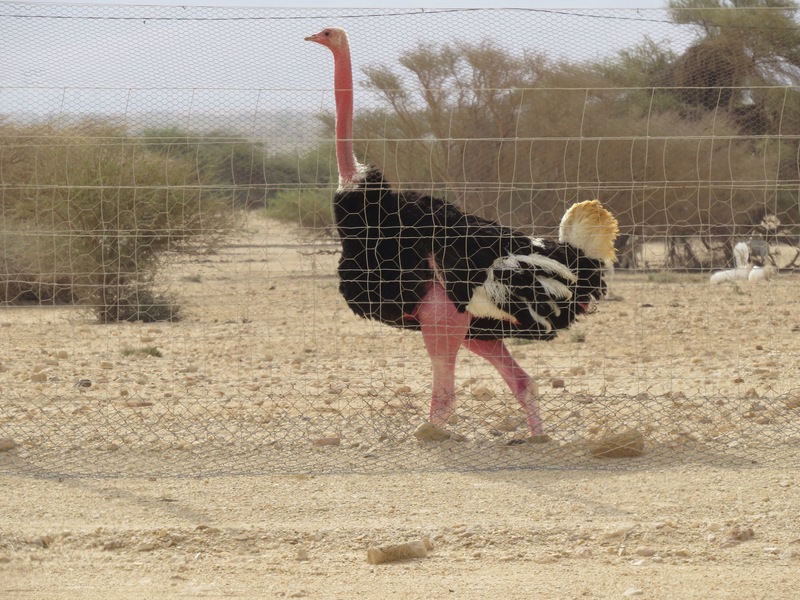 This entry was posted in Birds, Israel, Judaism-Birds Connections and tagged Desert, Hai Bar, Israel, Ostrich, Talmud, Torah. Bookmark the permalink. I’ll bet many people (myself being one of them) didn’t realize that ostriches were once common in Israel. Now we know. I’m so happy to see them running free in the preserve like this in the desert, instead of as an animal that one only sees in a zoo. OK, they have religious mention and are pretty impressive, but every time I see one, they make me laugh a little. Disproportioned I guess. Haha, so true, Donna! They’re quite comical to watch as they lumber along or run, but apparently their powerful legs and feet can be lethal! What a truly remarkable experience! Thank you for bringing that back up again.